As tour destinations go, Alta is very nearly at the top of the world (check us out on Google Maps if you aren’t sure where we are). But air travel makes this distance deceptive. You can get direct flights to Alta from Oslo that take only a couple of hours to fly here. If you are already in Europe, we are actually pretty close if you consider the time required to get here. So hopping on an airplane for a 2-3 day stay is practical and convenient, and if you keep an eye out for airfare bargains, it isn’t even very expensive. But is it really worth coming up just for a couple of days and a tour or two? Fly up here on a Friday afternoon. Check into your hotel and then head out on an evening hunt for the Northern Lights. You never know what you’ll see… clouds? A green haze? A striking display across the whole sky that shifts and dances overhead as your camera records the purple, green and vibrant red? The next day, get some breakfast and then head out on a snowshoe hike through the arctic forest. Try ice fishing, and have lunch around an open fire along the way. Back in town, shift to a more elegant mode and dine at Restaurant Haldde, sampling local flavors and ingredients. One more good night’s sleep and then it’s back down south. Like that tour idea? Read more details about it here. And if you want to make it a reality, get in touch with us and we’ll provide you the current price for it. If snowshoe hikes aren’t your favorite thing, substitute a fun dogsledding tour in the morning instead. Yes, we have details for that package as well! And if dogsledding is a favorite idea of yours, come to Alta and spend the night out at a husky farm. 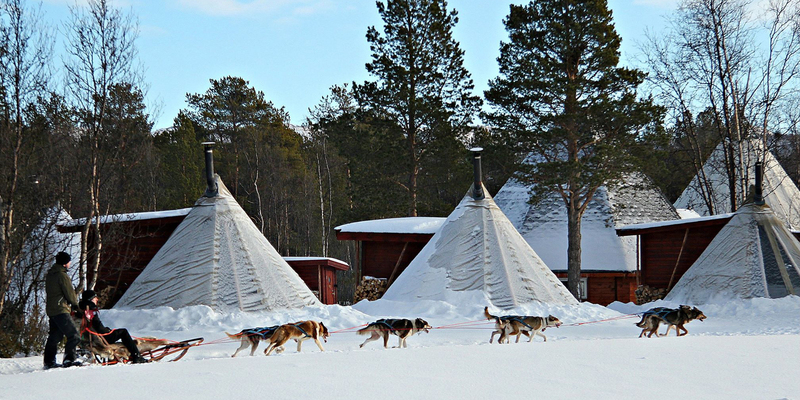 Dogsledding, dinner and an overnight in a heated lavvo tent with floor-to-ceiling windows will make for a magical experience. The next day, instead of a “typical” Northern Lights hunt, take an evening fatbike ride out into the forest. Keep an eye out overhead as you cruise along through the forest on your wide-tired bicycle. See that tour description here. Do we have more? Sure we do! Whether you have a night or two, or more than a week, we can fill your time with fun tours and activities in and around Alta. Just tell us how we can help, and we’ll put together a package with just what you want.